Home » Collection » Peter Orlovsky age 21 with our first car, old delivery truck "The Hearse," Telegraph Hill a block up from our apartment rooms 1010 Montgomery Street near Broadway Corner. We drove to Yosemite, the car cost $125. San Francisco 1955. 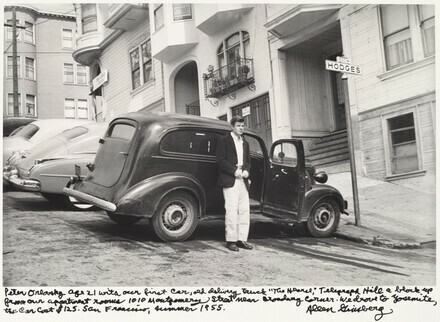 Peter Orlovsky age 21 with our first car, old delivery truck "The Hearse," Telegraph Hill a block up from our apartment rooms 1010 Montgomery Street near Broadway Corner. We drove to Yosemite, the car cost $125. San Francisco 1955.